Is the Doctrine of Imminence still relevant? If you take anything away from this and last week's article, let me sum it up by saying this; the greater the convergence, the lesser the imminence. The same is true in reverse, the greater the imminence, the lesser the convergence. It is impossible for both concepts to take up equal space on the same prophetic timeline. The only caveat to this then applies only to those who choose to remain ignorant of the signs of the times. Because the world pushed the 20th century into the modern age with advancements in just about every field of knowledge. One would think that in an era of instant gratification and information, life on earth would become sublimely utopic. Rather quite the opposite has occurred with this world's out of control addiction to technology causing many to self-alienate and disconnect from reality. It is at this juncture that we come to a unique paradox matched only in one other time in human history, the pre-flood world. On one hand, life for a majority of the world (the extreme third-world being the exception) has improved technologically, medically, economically, and socially. On the other hand, the Bible states that things will deteriorate morally, socially, and religiously as time goes on. Thus we have the convergence of increased knowledge and travel (Daniel 12:4) which has resulted in the overall increase wickedness and violence on a global scale. And the unintended consequences of man's increased free time and liberty due to said technological advancements (Gen. 6:5; Luke 17:26). One of the consequences of the curse God put on Adam after the Fall, was that man was to toil and work the land to survive (Gen. 3:17-19). For most of human history, life on earth was brutal and tough. When a civilization reached its apex, what inevitability ensued was a rapid deterioration in that society's morals and values ultimately making societal collapse all but inevitable. We are again at this summit of where mankind need not struggle to eat, shop, buy, marry, etc. ...the fitness of man for a condition of extreme liberty, and the worth of a trust in the innate justice supposed to lie at the bottom of the human heart, have been already tested by the great Creator. Modern philosophers are urging a repetition of the experiment; but the history of the times of old proves the fallacy of their views. For the wickedness of man became great; all flesh corrupted its way upon the earth, and the earth was filled with violence. And as it was in the days of Noah, so shall it be also in the days of the Son of Man. The Bible is quite clear when speaking about certain future events which have to happen. Scriptural logic leads one to understand that events rarely just happen instantaneously. There is an unfolding of connected or interrelated events that makes something that seemed either impossible or unlikely, all but inevitable. For example, the Bible speaks about Israel becoming a nation again for the second time (Amos 9:14-15, Isaiah 11:11-12, Ezekiel 37). But were it not for World War I and II, the rebirth of the nation of Israel could not have happened. Could God have brought Israel back into the table of nations without major global wars? Sure, but that is not how things have transpired. So it stands to reason that our recent history has unfolded precisely as God intended it, along with its intended results. Israel, as John Nelson Darby taught it, was God's timepiece. If that is true, then Israel's entire history going back to Abraham should be the most chronicled and detailed of any people who ever existed. It is. As many today note, Israel is the super-sign of the end times. Israel's rebirth as a nation after almost two millennia in Diaspora is absolutely a miracle. No other nation can make that claim. But before Israel became a nation again, there was the stirring of the Jewish people to return to their homeland. The Zionist Movement, which began in 1897 by Theodor Herzl, along with strong Dispensational and other Christian evangelical support, became momentum that would continue from 1897 through 1948. From a Christian perspective, that support didn't occur in a vacuum. Darby's support in the early 19th century for the return of the Jews back to what was then just a backwater province of the Ottoman Empire became influential amongst other Dispensationalists. Many of the early Dispensationalists had come out of the Anglican and Presbyterian denominations to make up the Plymouth Brethren. Their influence in part helped later shape decision makers like Lord Balfour to instruct England's political position on the rightful return of the Jews back to what was then called Palestine. As World War I began drawing to a close, it was clear that the Ottoman Turks were in no position to continue ruling over the Middle East, thus European powers began to drawing boundaries to set different nations again. With England's support for the now growing European Zionist movement, teachers and preachers of Dispensationalism were cautiously optimistic that they were witnessing God's word being fulfilled. Men like C.I. Scofield, Clarence Larkin, and others wrote decades before 1948, that the Jews would become a nation again just as the Bible predicted it (Jeremiah 31:35-36, Ezekiel 37, Amos 9:15, Isaiah 2, 11)...and so it was. This Balfour Declaration encouraged and renewed the strength of the literal view of scriptural interpretation and they began to understand that as Israel goes, so goes God's clock for the world. Watching the progress of Israel becoming a nation again, meant for these early watchers that the fullness of the Gentiles and the time of the Gentiles would soon be drawing to a close. I call this period of time Transitional Imminence simply because although the Church could see God moving and shaping events, Israel had yet to become a nation again. On November 29th, 1947, the United Nations approved a Partition Plan that agreed to divide up what was then Palestine into a separate Arab and Jewish state. The Jews declared their independence some six months later on May 14th, 1948, and were immediately attacked by their Arab neighbors. And from then until now, Israel has tenuously and cautiously lived in a neighborhood hell-bent on her destruction. The significance of her rebirth has worn off since many are not old enough to remember a time when there wasn't a nation of Israel. There are many today who don't even remember a time when Israel wasn't in complete control of Jerusalem. Much time dulls the eyes of many in the church. The idea of imminence being limited might sound odd to the reader, but what is implied is that our window for Christ's return is rapidly shrinking, thus limiting the timeframe in which imminence can be completely unknowable. Again, we can't know the day or hour, but we will recognize the season. We know this as a certainty, because when Jesus gave His Olivet Discourse...He added a comment about convergence that matches up with the later revelations that were given to Peter, Paul, James, Jude, and John. We know from the rapid advancements in the past century with technology, communications, warfare, digital currencies, medicine, natural and manmade disasters, that it is quickly placing us in a time that matches the capabilities present in the seven-year window known as Daniel's 70th Week. Along with the geopolitical arrangements with nations aligning themselves as they are (The United Nations, the European Union, Russia, Iran, Turkey, etc.) also point toward the world in which final day events play out. On top of that, we see what was once the stronghold of the Christian faith in the West is crumbling. Just as political and military power have primarily moved westward over time, we now see the Christian faith moving eastward as God the Holy Spirit once again moves mightily in the Old World. Adding to this is the world's continued attempts to divide and destroy tiny Israel. All of these (the ultimate convergence) points to the conditions in which both Jesus and Paul called birth pangs. Skeptics might debate that last bullet, but let's say hypothetically that the letter to the church at Laodicea was placed anywhere other than at the end of the seven letters. If that were the case then this prophetic application wouldn't make sense and skeptics would be correct in their rebuke of such a claim. But because the letter to Laodicea is at the end of the letters, we can see a clear progression that also matches what we know from church history. In other words, the church ages (or epochs) can clearly be seen when we review how Christendom has unfolded around the world over these last two thousand years. Remember, Laodicea was just as real a church at the same time as Ephesus or Smyrna was. While it is not necessary to hold to seven-letter seven-epochs as the gospel truth, it is noted that throughout church history, one type of church tends to be the dominant face of Christendom. Each of the churches unfolded in an age in which their brand (or their type) tended to dominate any other form of Christendom. There was an Ephesus era that had the Apostles who were still walking the earth. But that time came to an end when John passed on into glory. There was a Smyrna era in which the Church then (100-313AD) came under intense persecution from the Roman Empire. There was an era when the Roman Empire legalized Christianity, and thus we see the mixing of paganism into Christianity that is exemplified in Pergamum. So on and so forth. Put an another way, they unfolded individually as eras, but they continued on and overlapped, thus waning in power and influence and giving heed to the next type (or form) of church era. At the very least, the last four letters to Thyatira, Sardis, Philadelphia, and Laodicea are all still in play. Since the 1960's, the West has rapidly digressed into antichristian territory with the onset of the Sexual Revolution, the reemergence of Eastern mysticism, embracement of socialism, and rapid increases in violence and the occult in entertainment. All of these have morally weakened societies around the Western world, and have enforced a compromise-or-die type of mentality upon western churches in particular. Thus in trying to remain relevant, we have the compromised Laodicean era who is hell-bent on making being lukewarm the hottest trend around. All that to say this, that if these churches are in fact chronicles heralding the stages the church would go through, then it is equally reasonable to assume that they had to play out first, in order for Christ to return for His church. So while it was reasonable to assume that no sign preceded the Rapture of the Church for most of its history, we now have the luxury of hindsight and can see we are at the last stage of development in the age of the Church. It is not until the conclusion of this last Laodicean church, that John see's the door in heaven open, and hears a voice as a trumpet call from there "Come up here!" In 2 Timothy (see above) the Apostle Paul is giving a warning of the last days. He says in verse one that these days will be terrible times. Then he proceeds to give us a vivid description of evil hearts in the last days. In the book of Mark (see above) Jesus tells us that it isn’t what goes into a man that defiles him, but what comes from the heart. He then gives a vivid description of the results of evil hearts. Notice that these two passages are very similar. Jesus showed the results of an evil heart. Paul points out basically the same, and says that the last days will be terrible due to the evil actions of evil hearts. While thinking about this, I was thinking that we have always had these types of evil people among us. You’re probably thinking the same. 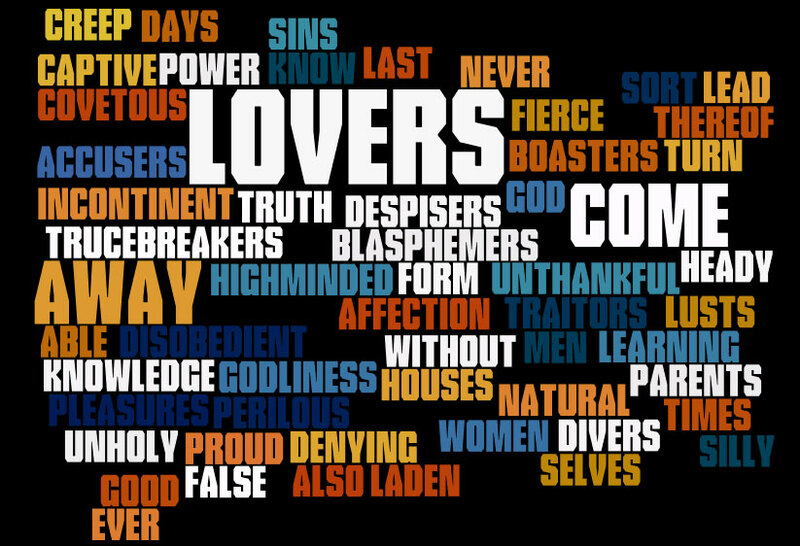 We could pick any of the traits above from Mark and 2 Timothy and probably think of someone or some event that is apropos to the above. And this takes us back to Mark 7:21-22. Now go back to these verses and see what Jesus saw in their hearts that the populace could not see. Look at the descriptions again. I’m sure they fit quite well, and boy were these guys squirming. Now let’s return to what Paul told Timothy about people in the last days. Again, this list (see the list above) is strikingly close to Jesus’ list in Mark. Yes, there have always been these types of people in the world. However, in my opinion, I believe these types of people are more pronounced today worldwide than ever before in the church age. Maybe they were more obvious in certain areas or groups in years past, but today, these types encompass the world. Another thing to consider is that Jesus and Paul were referring more so to those who claim to be religious. They weren’t speaking necessarily of the world as a whole, but specifically to those with apostate hearts; i.e. those who appeared to be religious, or even “Christian.” Jesus was referring to Pharisees and teachers of the Law, the religious crowd. Paul was referring to false teachers (see 2 Timothy 2:14-26), the religious crowd. All of these are religious apostates. An apostate is “one with full knowledge of the truth of the Gospel, perhaps even professing a belief in the Gospel at one time, but ultimately turns against it and rejects it.” The Pharisees and teachers of the Law were being religious, but actually renouncing the heart of the Law of Moses. Obviously, the false teachers were renouncing anything and everything Paul was teaching the churches. When Jesus was talking to the Pharisees and teachers of the Law in Mark, it would have been in the last days of the Jewish age of 490 years they were allotted by God (see Daniel 9:24-27). Think about it. The Church age would start at Pentecost in just a few months. Then there are only seven years remaining to fulfill the 490 years allotted by God. This will be accomplished during the seven year Tribulation. If you mentally remove the Church age, which is parenthetical, they were in the last days. During those last days they had become corrupt, and will more so until their eyes are opened during the Tribulation. The Church, based on the prophetic signs in Scripture, is also in her last days. Now I want to be very clear about our being in the “last days” for the Church. I do not know how close we are to the Rapture, which precedes the Tribulation. Only God knows that date. It could be today, tomorrow, several years off. I don’t know. All I can say is, based on God’s Word; we are certainly within the season of His return. In summation, my point to make for these two Scripture passages, Mark and 2 Timothy, is that these types of people come from those who claim to be religious. They claim to be Christian, but they reject the Truth, claim the lie and are what we see listed in Mark 7:21-22 and 2 Timothy 3:2-5. Our churches today are overflowing with these types of people. They talk like a Christian, walk like a Christian, act like a Christian, dress like a Christian, etc., but their heart is elsewhere. These people claim Christ but serve Satan. They are no more a child of God than the Pharisees and teachers of the Law who confronted Jesus and wanted Him dead. The people of Israel, specifically the leaders, were basically apostate. They had drifted far away from God’s Law. Jesus hit the “pause” button with Israel and will finish His work with them during their last seven years; i.e. the Tribulation. The Laodicean church is alive and well in our day. It is obviously apostate to the core, all the way up to its so-called leaders. Perhaps sooner than we realize Jesus is going to hit the “start” button by removing His true Church, then finish His dealing with Israel and the world at large. There is a lot a information packed into this single verse. To begin with, it says 'for by grace you are saved THROUGH FAITH' - let's stop there for a second. 'Grace' (Gk charis) means benefit, favor or gift. It is from the word 'grace' that we get the word 'gratitude' or the sense of being grateful. Let's look at the next section of the verse, 'And that not of yourselves'. What is not of ourselves? Grace? If it refers to grace, then the Lord has wasted words unnecessarily. Of course we can't extend grace to ourselves! It is not only impossible, such an extension of grace would be meaningless. We haven't the authority to save ourselves. Read the verse again. "For by grace you are saved through faith, and that not of yourselves, it is the gift of God." Since we already KNOW that grace 'is not of ourselves' that only leaves one other element that can be the 'gift of God' and that is saving faith. So the Scriptures say that even the faith that saves us is a gift from God, and not something we conjure up as a result of our own works, 'lest anyone should boast.' This verse is the great equalizer of Christians. We all come to the Cross the same way; recipients of God's extension of grace, which we receive by a faith which is God-given. None of us has any reason to feel superior. If we are saved, it is because we were drawn of the Father to the Son. 'Holiness' (Gk hagiasmos) means 'purification' which is a PROCESS, also accomplished by God through Jesus. We are eternally secure, because we are eternally saved, which was accomplished in the Mind of God when each of us was called -- BEFORE THE WORLD BEGAN! Let's bring it together. 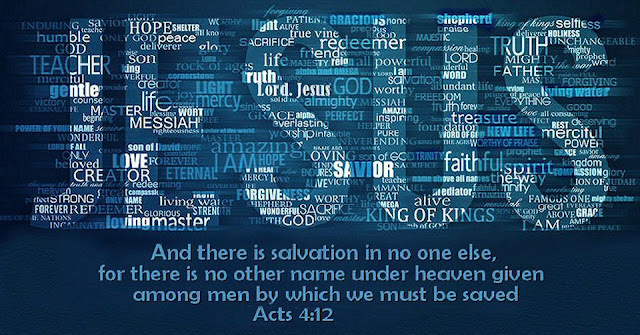 Nobody can come to Christ unless they are drawn by the Father, who provides us with both the extension of the offer of salvation and the faith necessary to receive it, a calling that was sealed in heaven before the world began, according to His purpose and grace. It is an understanding that our relationship to Christ is unique -- that God knows our hearts, and has already judged us accordingly. So that sin cannot reign supreme in our mortal body and thereby render us useless to our calling. Paul says we put on the 'armor of God' in a specific order. The certainty of the truth of Scripture, the breastplace of righteousness (imputed by Christ) the knowledge of the Gospel and the shield of faith. Our heads are protected by the 'helmet of salvation' - the certainty of our eternal salvation. These are all DEFENSIVE weapons. God chose each of us, and His plan is to use us to seek out those similarly chosen and introduce them to their Savior. That is our assignment on this earth. THAT is our 'calling.' To spread the Gospel. That isn't Calvinism -- Calvinism teaches that because the Church was predestinated, we are under no obligation to lead people to Christ -- God has already chosen them so He'll sort it out. There is a joke about the Calvinist who fell down the stairs, and remarked, "Thank God that's over." Instead, the Scriptures teach that God foreknew who would be saved, therefore it is predestined. But God also knew who He selected to carry the Word to that person. And the enemy will work overtime to thwart God's will by convincing us we are not worthy to carry it. Jesus said of His sheep (the Church) "And I give unto them eternal life; and they shall never perish, neither shall any man pluck them out of my hand." "Give" (Gk didōmi) means 'to bestow'. It is a present-tense verb. The Scripture does NOT say, "I WILL give them eternal life," it says it has already been bestowed upon us. Our works are the 'fruits' of our labor for Christ. Our labor is to lead others to Christ. The mission is to provide each one of us with the information necessary to equip us for the work of one on one evangelism. Henry Ford once said, "I'd rather have one percent of the work of a hundred men, than 100% of the work of one man." Ford was the father of mass production. In the time it takes for one man to build a single car, a hundred men can build a thousand cars. Don't let the enemy render you powerless. You ARE worthy, not because you are you, but because of Him Who made you worthy according to His will and by His own Hand. v. 5 But the LORD came down to see the city and the tower which the sons of men had built. In another day and age, there was a demonic dream by a dictator to rule the world. His name was Nimrod and he gathered all the people of the earth on the plain of Shinar to build a tower to reach to heaven. This was after the Noadic flood and man thought they could build a tower higher than any flood and if God brought another one, they would have a tower above the waters. They failed to remember that God said He would not send another flood and put a rainbow in the sky as a promise never to do likewise. But that really wasn't the real intention of the people during this time. The tower was an afront to God and His command to disperse and repopulate the earth. This was another era that men wanted to stay as one people and with one language and to disobey God's command. And to become a God unto themselves and worship themselves and their dictator who ruled them. Fast forward to this generation and the two words that men are promoting, just as Nimrod promoted in this ancient time period is a one world government and a one world religion. Globization means the destruction of any nation/state that make any author of globalization traitors to the nation of their birth. These individuals have sold their allegiance to foreign powers to absorb their country in a pipe dream, much as Nimrod did in the tower of Babel. Take the United States for example, we have nothing in common with African nations such as Kenya or Somalia, save they are nations on opposite sides of the planet. But according to the United Nations Globaization Plan, a vote from Washington DC would carry no more weight in decisions affecting foreign policy that a warlord in Africa, whoever the warlord happens to be at any given moment. In the U.N.s misguided vision, to promote “good will toward men” wishes that nations in Africa enjoys the same living standard, say of my home state of Missouri, even if means lowering the living standards of Missouri to be equal to the living standards of Kenya or any other African nation. Both will live in squalor. It will steal from the rich and give to the poor, or so they say. 'Multiculturalism' means having no individual national culture at all. The UN's vision of multiculturalism demands a common language (other than English, the language of the hated West) something along the lines of Esperanto, a nonsense language made up by globalists so that the whole world can be confused at the same time. In the U.N.'s plan on globalization to promote a One World government, they are using the words “globalization and multiculturalism” to disguise a plan to destroy the Western Nations of the world and become the New World Order on the scale of what was envisioned back in the time of Nimrod and the Tower of Babel. If you have studied the effects of Agenda 21 that has morphed into Sustainable Development and Agenda 2030 proposed by this international body of misfits, it is designed for all people and nations to become one with a common language and claims of a utopian society, but in reality it is designed to control every human being on this planet in their buying and selling, their movements, and even their reproduction rates to a “sustainable level” to guard the environment and save the planet. What does that mean? It means genocide of all non essential individuals that do not contribute to the well being of the collective society. Meaning the old, the disabled, the mentally challenged, and the inferior races. It is the plan of the Third Reich of Hitler on steroids. In Genesis chapter 11, gives us a glimpse of both who is behind this globalization/multiculturalism and what its purpose really is. This seems ironic, but fascinating as the EU is officially a godless state, but on the otherhand, its promotional literature openly mirrors the Bible's story in both its application and its intent. By application, the residents of Babel, under the sole dictatorship of Nimrod, attempted to circumvent God's judgment by building a tower 'whose top may reach to heaven' as a refuge -- should God again judge the world by flood. God was hardly afraid that mankind would challenge His Authority. Rather, He knew they would try and what the solution to such a rebellion would result in. It will result in the whole world being under the sway of the coming Anti-Christ dictatorship. Nimrod and by extention, the Anti-Christ attempts to stand in place of God and the “protector” of the human race. Both men of history of mankind, past and future, want to take the place of God, demanding worship as if they were God. This is the rebellion that God was aware that would happen, if left unchecked. God intervened by His will, in the historical example of the tower of Babel and confused the languages of those who were in rebellion to His command to scatter and repopulate the earth, and were making themselves a god, in Almighty God's place. But God doesn't intervene in the Tribulation period to save mankind from himself, the way He did at Babel. At the tower of Babel in Nimod's time, Jesus had not been crucified on the cross for a choice between good and evil, in shedding His own blood for the payment of mankind's sin. Today, the cross and it's provision of forgiveness of sin by mercy and grace is in place, and God will allow men to reverse the “Babel effect” and let human nature run its course. The end result will be the same as it would have been at Babel, had God not intervened early and human history would have been cut short on the plains of Shinar. Having allowed mankind one last, unimpeded effort at rebellion against His Authority, the Bible says that during the Tribulation the armies of the world will gather for a final battle on the plains of Megiddo during which they will turn their weapons of war against the Creator of the Universe Himself. What does reversing the Babel Effect mean? The depravity of mankind virtually SCREAMS “rebellion” while the biblical imagery makes it clear that it is deliberate, it is calculated and it is directed against the God of the Bible. I have people who argue about the coming tribulation and the end of the age, but if what is coming upon the earth is not clear to them and what end time prophecy is addressed to , no amount of logical or scripture persuasion will convince the reprobate mind to understand what God is saying is coming upon the earth. We have signs and seasons and the clear words found in your Bible, that indeed we are living in end of the age of mankind's rule upon this earth. I call it “willful ignorance” that is a willfull and deliberate choice NOT to believe the truth to avoid the conflict of conscience that accepting the truth would demand. If you go to any Christian forum, you will find many debaters that infiltrate the discussion and try to seize on any inconsistency in the scriptural proof found in God's Word. There is no inconsistency, but in their own minds, to confirm their chosen prospective of self denial and go away comfortable in their unbelief. If anyone of us look closely at our environment, either politically, physically and most assuredly spiritually, we can see an evil taking over the affairs of this world and its population of earth dwellers. It is the phenomenon described by the Apostle Paul which comes to fruition following the Rapture, but we can already see it coming together in its final form on this side of the Tribulation Period. 6 “And now ye know what withholdeth that he might be revealed in his time. The Anti-Christ is coming and he is standing just off the stage of this world and it not in the spotlight, just yet. But Paul writes when this final “Nimrod” sets up his kingdom of this coming New World Order, he will have the enthusiastic cooperation of the whole world who are ignorant of the dangers of globalization and multiculturalism, blissfully unaware of the demonic deception foisted upon them. Peter makes it plain that the reason for their unbelief is a willing ignorance born out of their lust for the things of the world and their choice NOT to believe, no matter how strong the evidence. I find is amazing and it has to be God's timing, that this lurch forward to the New World Order has been put on hold. Note the news that our current POTUS has pulled the USA from the Paris accord that the last POTUS, I call the “idiot in chief” got us into. Climate change is a bizarre attempt to take the bogus claim of man made climate change and turn it into a NEW WORLD ORDER called Sustainable Development, with all nations being equal and the destruction of the western way of life, that the world is jealous of and desires our downfall. OH, it will come, but we pray we have been given a reprieve, for a time, from the evil desires of One World Government proponents that are headed by the richest and most powerful individuals in the world. Some call them Illuminati, or Bilderberg Groups that have a globalist visions of grandeur to their demonic plans for the world's utopian society. When will it come? I make a prediction, and it's set in stone. In Revelation, we see in the throne of God, a scroll handed to the Lamb of God, who opens each seal. Thus begins the wrath of Almighty God upon the earth. In the following verses, each horse of the four horseman of the apocalypse rides bringing destruction upon the earth. This is the Wrath of God. Some will in error, postulate that this is the doing of Satan and it is his wrath upon the earth. But note who is opening the seals of the scroll? It is the Lamb of God, Jesus the Christ, who makes these events happen. He uses each of these horses riders to enact judgment upon this rebellious earth, much as He used men to bring Israel to judgment by using Assyria and Babylon to bring justice to those who have forsaken Him. God wil use Satan and the evil intent of men's heart to begin His act of judgment and wrath upon the earth. As chapter 6 unfolds, the men of the earth know who is bringing judgment upon them. There is NO question in their minds, who is responsible for this destruction. God's wrath has begun and as the chapter continue the judgment only gets worse by each chapter. This New World Order is going to be judged and those who follow the modern “NIMROD” the Anti-Christ will be found doomed in their rebellion. Two things will happen in this coming horror that comes upon the earth. -all rebellion upon this earth will be extinguished. 19 “And the angel thrust in his sickle into the earth, and gathered the vine of the earth, and cast it into the great winepress of the wrath of God. Can you imagine this amount of blood that covers the whole valley of Megiddo for 25 miles or so, as deep as the bridle of a horse?? That's called righteous indignation, and total slaughter of those in rebellion. This is the final judgement on this demonic “New World Order” when God will pass His fiery indignation upon those who have followed this new Nimrod, the Anti-Christ. “21, For then shall be great tribulation, such as was not since the beginning of the world to this time, no, nor ever shall be. 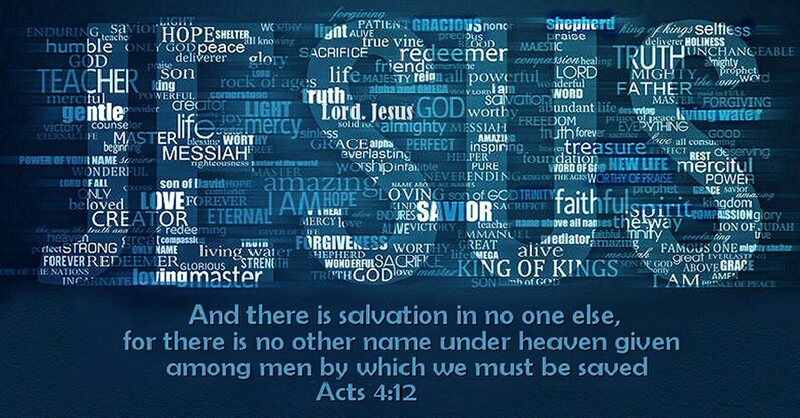 “15 That whosoever believeth in him should not perish, but have eternal life. Who is the Way, the Truth and the Life? Jesus is the man/God who died on a cross for you, and for me, so that we would not have to experience this coming time of extreme death and suffering. Repent of your sins and ask Jesus to come into your heart and life, and make Him Lord with what life we have left upon this earth. 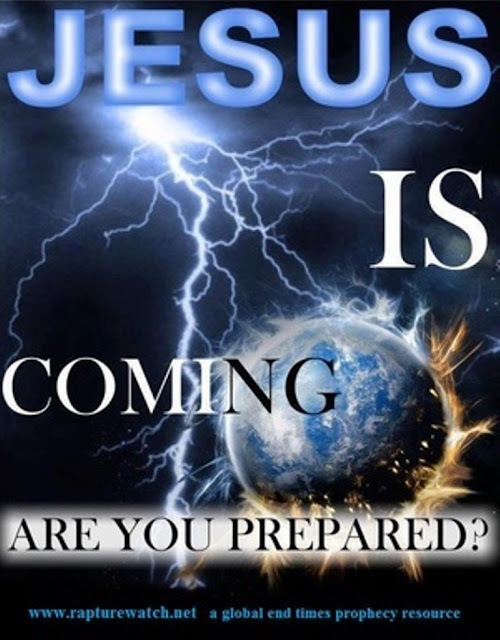 Make your decision for Jesus Christ, or be ready for the destruction that will be found in the NEW WORLD ORDER. This is Pastor Mike Taylor, praying you call upon Jesus as Lord and Savior and believe the verses I have given. If you need prayer, counseling or just a friendly listening ear, then email me at realteam1999@sbcglobal.net, or visit me online at www.pastormiketaylor.blogspot.com, God bless you all.